While doing laps at the pool one day, I came to the conclusion that the penguin is the most courageous and admirable of birds, because swimming is a meditative act, and a cleansed mind occasionally entertains notions of avian mettle. Not the eagle, I decided, which coasts by on piercing looks but is secretly not above scavenging, nor the owl, whose fame for foresight is wholly unearned, bested in wit by any parrot or common crow. No, I concluded as I flipped and pushed off into another length, it is the penguin I revere in all its awkward, earthbound glory. I admit my bias. 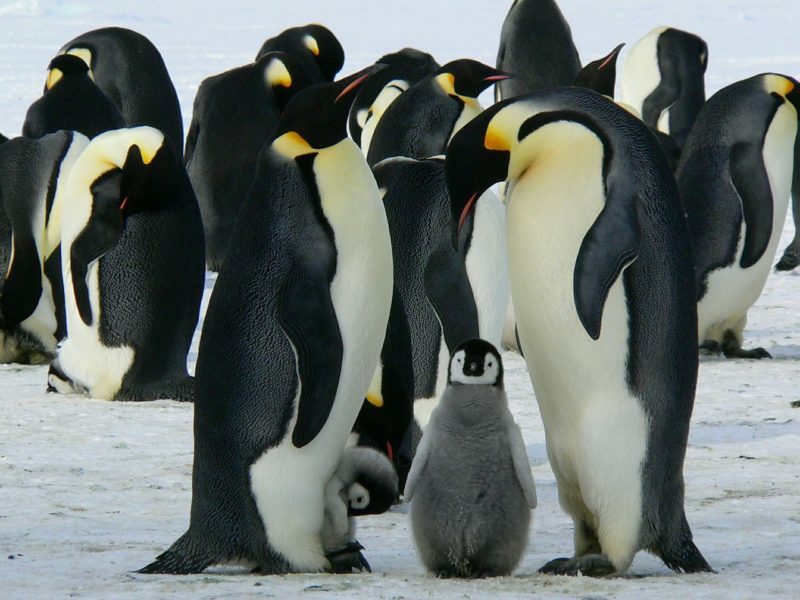 When I think penguin I conjure Emperor – all else falls away. It is unfair to the Adelies and Gentoos and the delightfully numerous Macaronis, but like most I cannot help but gravitate towards grandeur. Yet Emperor seems an ill-fitting label upon initial inspection. There is nothing regal about the bird’s stiff-legged gait, nor are rulers, whether they be enlightened or despotic, generally renowned for diving down half a kilometer in search of squid and silverfish. Monarchs have subjects and serfs and entire underclasses that cater to their cravings, while each metre-tall bird fishes alone, holding no sway over one another within their hamlet-sized rookeries. Perhaps Emperor refers to another trait. Perhaps George Robert Gray, the British zoologist who first described these birds, regarded them as I did, by their solid temperaments and sense of self-masteries, coming to believe that unlike men, each indeed contains strength enough to be an island upon itself, as a lord amongst lords. Yet as ice trumps rock and cold outlasts all, even stone courage is not enough in the end. Instead Emperors count upon their tender cores and gain fortitude through community. On darkest nights they shed their egos and come together to share precious body heat. In these huddles magnanimity reigns supreme, with each bird rotating from center to periphery and back again, giving with all that they have, accepting with all that they are. In this utter pitch each flipper brush becomes a benediction, each faint touch a deliverance from oblivion, affirmations of penguinhood. “Solidarity,” Emperors murmur, alone, in unison, laconic. Like most forms, penguin courage also has roots in love, for Emperors are versed in the language of promise. After laying one egg the female departs to feed, leaving her mate with months of incubation duty, with each pinning their future entirely upon the other. For many couples this hope fails, for the seas are perilous and populated with leopard seals and orca whales – there are no guarantees in life. Yet Emperors choose to take the risk, being too ignorant or wise to evade suffering by avoiding commitment, and so for the partner who sees his vision return from the void after days uncounted, sleek and plump and reeking of fish; for the other who trudges a hundred icy miles home to see her beloved grim and gaunt but still standing over their progeny, the exaltation in knowing their bond is stronger than all that tried it must be beyond measure. This secret spheniscid bliss we are not privy to may not surpass the one we humans weave into song and poems. Yet perhaps it is not less. But the courage I admire most about penguins stems from their clarity of conviction. Swimming in my lane, rope floats on both sides, square tiles beneath my feet, length after length, stroke after stroke, I realize that despite fleeting moments of elation and freedom, mine is still a contained life, a chlorinated existence. The search for kinetic joy and durable meaning involves shedding solid ground time and again to embrace a world of depth and risk. The penguin understands that it can only be performed over the black abyss, and is never very safe. Getting out of the pool, I decided to one day take up open water swimming, to follow the currents of fear and hope so thoroughly charted by my aquatic brethren, the bravest bird of all. Isaac Yuen’s creative nonfiction can be found in Flyway, Hippocampus, River Teeth’s Beautiful Things, and Orion, among others. He is the creator of Ekostories, an online essay collection that connects narratives in art, media, and literature to nature, culture, and identity. Isaac lives in Vancouver, Canada, on unceded Coast Salish First Nations territory.